The way the brain works is incredibly complex, but this simplified explanation will give you some understanding of where our left-hand dominance comes from. 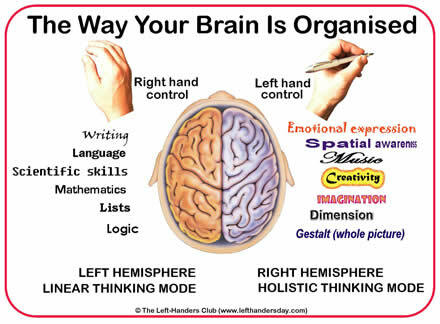 The brain is “cross-wired” so that the left hemisphere controls the right handed side of the body and vice-versa and hand dominance is connected with brain dominance on the opposite side – which is why we say that only left-handers are in their right minds! The left hemisphere (RIGHT HAND CONTROL) controls Speech, Language, Writing, Logic, Mathematics, Science, this is the LINEAR THINKING MODE. This brain dominance makes left-handers more likely than right handers to be creative and visual thinkers. This is supported by higher percentages of left-handers than normal in certain jobs and professions – music and the arts, media in general. (See the results of our Lifestyle Survey of Left-Handers for our detailed findings) Left-handers are also generally better at 3-dimensional perception and thinking, leading, for example, to more left-handed architects than normal. Left-handers are also usually pretty good at most ball sports and things involving hand-to-eye co-ordination. 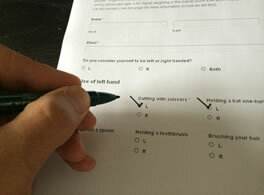 The view that left-handers are clumsy and awkward is not down to their natural abilities, but being forced to use right-handed tools and machinery which is completely back-to-front for them. If you are interested in the latest research and findings on left-handedness, you can buy the excellent book Right-Hand, Left Hand by Chris McManus in the online shop. LHD Blog Posts How left are you? I read that if you are left handed in second generation, the brain halves are actually the other way round. Or rather said, I learnt this in lessons, I ´m wondering. Being in the medical field pose a challenge for medical professionals, most instrument are made for the right handed, learning how to use these devices pose a daily challenge, but being determined as a left handed person I was not defeated, I am now retired and remember those days. now this makes sense cuz i always do things to the left, thank you website! I did a quiz earlier that said my right side was 72% dominant and mainly used up on music. I always feel I should have been left handed but got takes out of it at primary school. Looks like that’s true. 1.I visualize things to understand them even in case of programming. 2.my imagination power is very high. 3. I am proud of my rapid eye movement done to understand things fast. 4.when I am happy I enjoy every moment to its fullest. 5.but when I am feeling bad…I am completely down..In that case each moment is very devastating for me. 6.people say you should type with both hands…and I with left only. 7.I am prone to fear of people….rejection by friends by society. 8.currently have mild social phobia.so when somebody is explain to me..I don’t get what he/she is saying..Instead I find it good to understand things via Internet as nobody watches me at that time. 9.now days it’s my habit to visualize even the most difficult thing.and if I can’t then my interest about that subject is lost. 10.I over think about happy and sad moments. 11,I cannot tease others but when others do it…I get very angry. 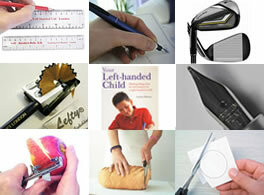 Are these common things for a left hander?